I was introduced to the TDI in May of 2006 as an apprentice to Robby Plenge of Meyerhoff Auto Haus; aka "Runonbeer" on TDIclub. 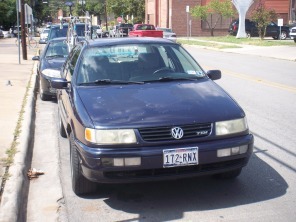 Robby helped me repair and learn volumes about my first TDI; a 1996 Passat. I tip my hat to Tim Dipple of Temple, TX, who procured that car for us after it was abandoned with a broken timing belt. As friends and small business owners, Robby and I confer daily about all aspects of our work including Bosch EDC control systems, repair procedures, diagnostics, bookkeeping and taxes. The majority of my business is driven (sometimes towed) to my shop by the TDIclub. I owe my livelihood to both Robby and the TDIclub.com membership. I give back to the membership monetarily and through technical support online. After completing my physics degree at Southwest Texas State University, I relocated to Colorado in June of 2008 and have been wholly enjoying my life here. Diesel Land became Colorado's KermaTDI dealer shortly after I moved to the area. We have built a symbiotic relationship which goes beyond trade. I am proud to be treated as family by Paul Maloney, Charlie Migliore, and Jason Vasholz of Kerma. Our relationship has helped me feel more at home in my new home; as well as benefited all of us financially and intellectually through further understanding of these cars and the operation and state of business in the automotive aftermarket industry. I'd also like to thank Pete 'Drivebiwire' Baranko, Jim 'Dieselgeek' Royston, Brooks Elliot, and my ever growing following of highly loyal customers. Pete is a pilot with a highly technical background who has devoted thousands of hours to learning, engineering, and meticulously calibrating the fuel delivery systems of our cars. Jim is a VW enthusiast, tinkerer, and ex-mechanic who develops and supplies aftermarket parts and accessories for our cars. His greatest gift to me has been his theories on time management and value. Brooks is a machinist. He is a perfectionist. I have never met anyone so humble, yet knowledgeable, yet eager to discuss what makes an engine run really well. Last but not least I thank my customers who understand our constraints as a small 2 man operation, and respect our unwavering commitment to performing the highest quality work at every visit. There are so many horror stories of so called mechanics throwing parts at problems, only to run up huge bills with improperly and unnecessarily installed parts. It's the reason that VW gets poor reliability scores, and their owner's frustrations with the brand. I love so much about these cars. The TDI is a comfortable, inspiring, and efficient car. I really enjoy catering to the enthusiast community because they share my passion for their vehicles. I want to make these cars affordable and enjoyable to own by maintaining and diagnosing problems correctly for a fair price, as well as fine tuning the vehicle to suit the tastes of the owner. TDIs are extremely efficient vehicles, and in that vein I am as environmentally conscious as possible. That means I won't be generating a mess or ecological disaster area associated with many automotive shops. Nothing goes down the drain or dumped out back; period. By recycling all scrap metal, used fluids, and eligible packing materials, I'm proud to keep garbage production at an absolute minimum. "An expert is a person who has found out by his own painful experience all the mistakes that one can make in a very narrow field."